Sure, the X-Men had given us the powerful Jane Grey (Famke Janssen) and fiesty Storm (Halle Berry) and the “reboots” put female characters front and centre but these were very much ensemble movies with (as usual) the men taking centre stage. When the Avengers first assembled back in 2012 there was hope of a Black Widow movie but as the franchise moved on this seemed less and less likely – especially after the release of the Jennifer Lawrence lead Red Sparrow in 2018. Even D.C got in on the act before Marvel with their wonderfully received “Wonder Woman” released in 2017. While Kevin Feige would probably argue that a female-led movie was always on the cards for the MCU, I can’t help think that the success of Wonder Woman helped pave the way for (or move forward) the production of Captain Marvel. 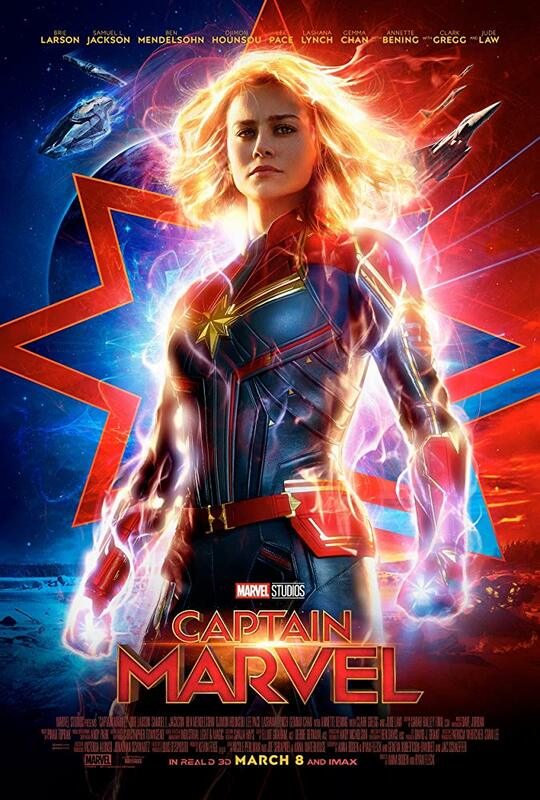 Captain Marvel stars Brie Larson as “Veers”, a Kree soldier with anger management issues who is sent to rescue a spy. The mission turns out to be a trap and leads Veers down a path of deception, self-doubt and self-discovery. Veers ends up on Earth in the mid-1990s which leads to some great moments for audience members of a certain age – the appearance of Blockbuster and Radio Shack brought a nostalgic tear to my eye and I think I showed my age when I laughed as Veers Googled searched the internet using Alta Vista, there’s also a great moment featuring a Windows 95 PC loading a CD ROM – kids today don’t know the agony! Anyway, nostalgia to one side, the story is pretty good and moves quickly. It’s one of the shorter films in the MCU at just over 2 hours so they had to cram a lot into the runtime but it’s handled well and you don’t feel as though there are many things that are left out. Being short it also passed the watch test – I didn’t look at my watch once during the course of the movie! That being said, it would have been nice to have seen more of the relationship between Carol Danvers (as she was before she became Veers/Marvel) and Dr. Lawson (played by a sorely underused Annette Bening). It’s obvious from the beginning of the film what an important role this character had in Danvers’ life and how she viewed her role in the Air Force and beyond. I think an extra 30 minutes of run time (bringing it to the length of a “standard” Marvel movie) would have allowed this relationship to have been developed more fully, along with Dr Lawson’s important back-story. The majority of the film is set on Earth with Veers/Danvers/Marvel (I think she has a few identity issues) teaming up with a young Nick Fury to stop a supposed Skrull invasion of the planet, which comes with a few twists – not only because the Skrulls are able to shapeshift into anything they see – “Can you become a filing cabinet?” “Why would I want to do that?”. There’s plenty of humour – most of which comes from Nick Fury’s interaction with Goose the Cat (I wonder if the name is an homage to Goose in Top Gun), and in fact Goose steals most of the scenes he’s in and certainly made me look at my two cats with a sideward glance when I got home! Jude Law gives a pretty average performance as Yon-Rogg – and there are reasons for this that I can’t divulge without giving out a big spoiler. It would have been nice for him to turn it up a notch in the final third of the film, instead I was left feeling like I was watching a young Albus Dumbledore in a Space Suit rather than one from Savile Row but it’s a passable performance (even if it lacks the necessary “oomph”). The effects are pretty good although I think the majority of the budget went on de-aging Samuel L. Jackson and as a result a couple of the scenes of a glowing Captain Marvel in space are slightly ropy to say the least. This is only on the screen for a few seconds though so can be forgiven (and I hope not repeated in Avengers: Endgame). So, do I recommend the film – I certainly do! While the couple of plot “twists” were obvious to me almost from the start of the film I found it very enjoyable couple of hours and it’s not often I wish a film could have been longer. Was it as good as Wonder Woman? Not quite. Given Wonder Woman’s 30 minute extra run time I felt it was able to explore that character a bit more than Captain Marvel, that being said Captain Marvel is still a great film and it’s wonderful to finally have a strong female role model in the MCU – Sorry Black Widow and Scarlet Witch, your background role antics just don’t cut it any more.